Agents of Mayhem is long, boring, and seems to lack the spark that made Saint's Row special. But even armaments that creative couldn’t hide the fact that combat was often a by-the-book affair. Enemies were brainless, and each encounter involved simply trying to get through it as fast as possible without dying. It’s telling that most of the memorable moments in Saint’s Row had nothing to do with combat, be it the Tron-esque “Deckers Die” mission, singing Biz Markie in a car with your friends, or an Aerosmith-backed rocket ride into space. With that in mind...why build a Saint’s Row game around combat? Okay, it’s not “technically” Saint’s Row. 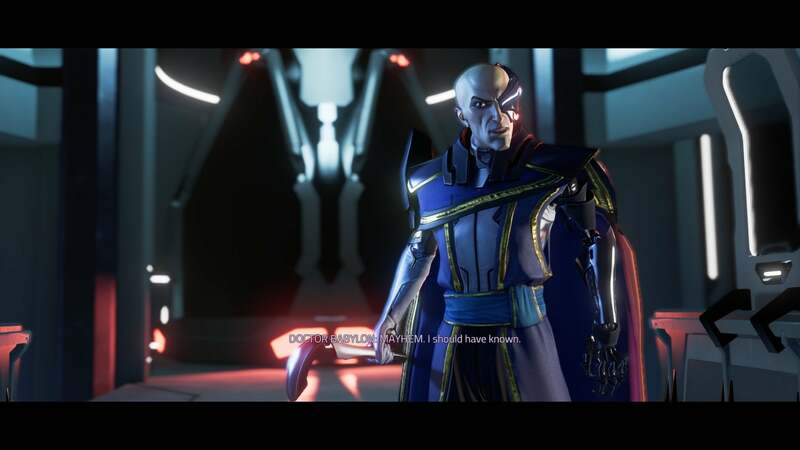 That’s the most technical technicality I’ve seen in gaming though, given Agents of Mayhem’s propensity for purple fleur-de-lis, as well as the crossover presence of multiple characters (including face-of-the-series Johnny Gat if you get the DLC). 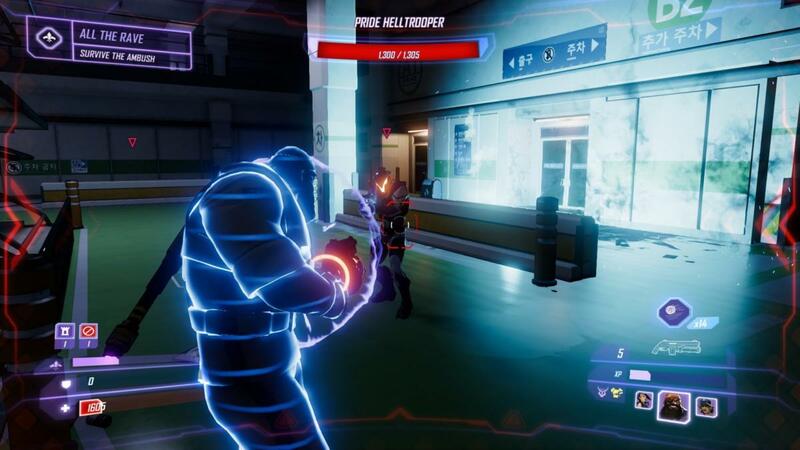 Agents of Mayhem is a spin-off, abandoning the Third Street Saints to focus on a G.I. Joe-style conflict between the good guys at M.A.Y.H.E.M. and the evildoers of L.E.G.I.O.N. 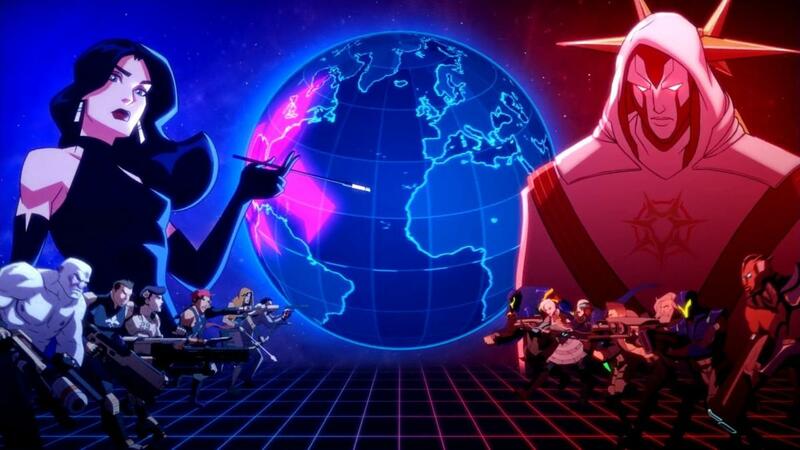 Headed by Dr. Babylon, LEGION’s goal is the usual take-over-the-world nonsense of Saturday morning cartoons, and the game has you traipsing around Seoul, South Korea trying to head off various doomsday plots. It’s a stellar concept, and props to Volition for leaning into it. Nearly every mission begins and ends with a short hand-animated cartoon, and I can’t imagine how much work went into these. Battleborn had one short segment like this. Agents of Mayhem must have nearly an hour of cartoon in its 15 to 20 hour runtime. The quality ranges from excellent to lackluster, but in any case a lot of effort went into presentation. If only the rest of the game were as creative. 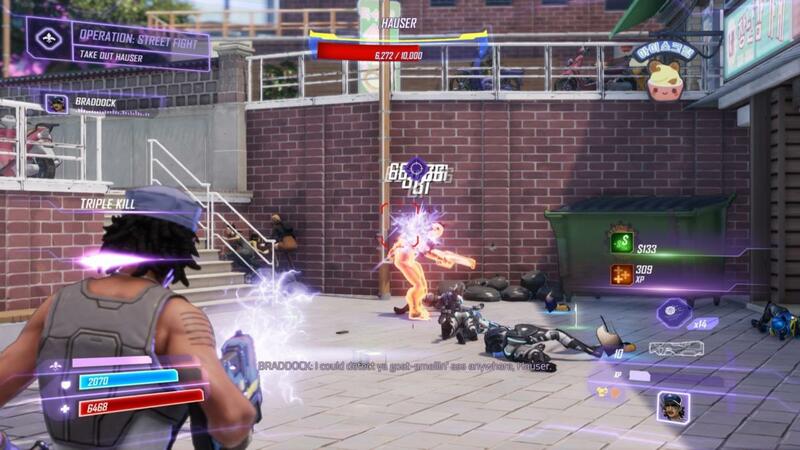 Agents of Mayhem is boring. There’s no way around it. My first instinct was to blame the writing, because there are certainly a bunch of story beats that don’t land. (More on that later.) After thinking on it though, it’s clear that the bigger issue is the rigid and repetitive mission structure, which completely undercuts any potential strengths in the writing. 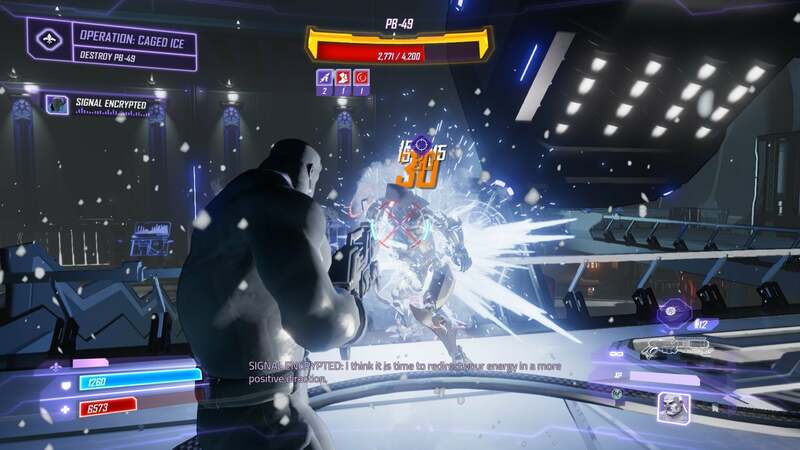 There are 57 story missions in Agents of Mayhem. At least 45 of them are clones. You go to a marker on the map to begin the mission—a start point that is always, inexplicably, at least a minute’s drive from wherever the real action of the mission is, so every mission begins with a lengthy drive to your true objective as MAYHEM’s handlers chatter in your ear. Wasted time. 1) You enter an area and are forced to hold off waves of the same five enemy-types for some random period of time, then go to another area and do the same, then go to a third area and kill more baddies, maybe blow up a couple of random items, and the mission ends. 2) You go underground into a LEGION lair, which is actually maybe a dozen copy-pasted rooms snapped together at random with no interesting features or regard to level design, with hallways that literally end in dead-ends if you go off the beaten path, so you follow the mission marker from room to room and kill all the enemies inside or occasionally “hack” three terminals by doing a button-timing minigame. Non-story missions and side content are even less inspired, seemingly just spawning into the world at random and consisting of either car races, foot races, or “Kill all enemies in this area.” Worse: They come back. You never really make progress on this front, because LEGION is constantly retaking the outposts you’ve conquered and repopulating the map with meaningless #content. This is a side effect of the central hook. See, in Saint’s Row you played as a single character. 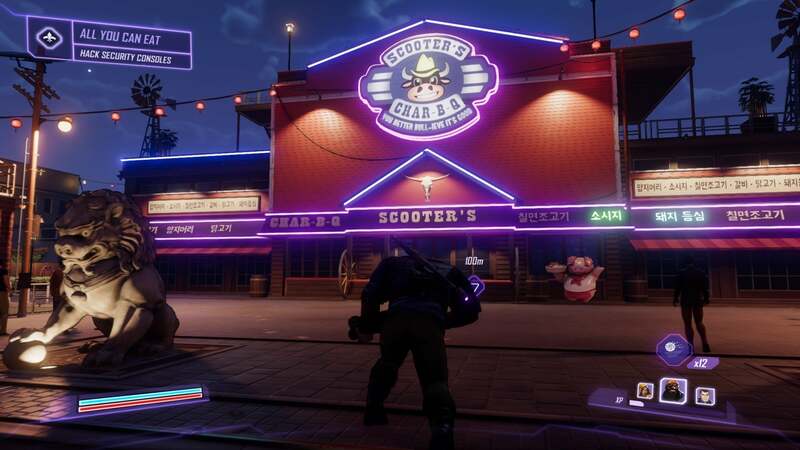 In Agents of Mayhem, you’ll notice it’s “Agents” plural. There are 12 characters on offer (13 with the Johnny Gat DLC), and you can control three at any given time. Like Overwatch or another hero shooter, but a singleplayer open-world game. Each character is, in Saturday morning cartoon fashion, a standard stereotype. There’s chaingun-wielding roller derby player Daisy, shotgunning ex-sailor Hardtack, ninja Scheherazade, and more. All 12 have unique weapons, as well as unique secondary and ultimate abilities—actor Hollywood, for instance, causes action-movie pyrotechnics to explode around him during his ultimate. Characters are a mixed bag, with some (angry Russian guy) being a complete dud, but again it’s clear Volition put a ton of work into this. Every character has a unique response for every single line of dialogue, so depending on who you’re playing as you’ll hear entirely different conversations. Pretty cool, though in practice it means dialogue varies wildly from “Solid” to “Lowest-Hanging Fruit,” and when you’re playing a dud character and a line dies on the vine it’s frustrating to wonder what better responses are hidden in the dialogue banks of characters you weren’t currently playing. It also means you’re likely to ignore some fun-playing characters just to hear decent dialogue from the handful of better-written characters on offer. The variety of characters on offer brings me to my point about side content though. There’s never any real progress in the city front because Volition clearly wants you to run missions repeatedly, leveling up every character over time. There has to be enough stuff on offer to get all your characters to Level 20—an undertaking that, I think, would take anywhere between 30 to 50 hours. Whether anyone will actually do that? Well, I’m sure someone will. I won’t though, and so it just leaves the city feeling painfully lifeless and nonreactive. Beginning to end, basically nothing about Seoul changes. To be clear, Saint’s Row’s side content also got repetitive, but ideas like Insurance Fraud (where you ragdolled your character into traffic to score points) had a spark to them. 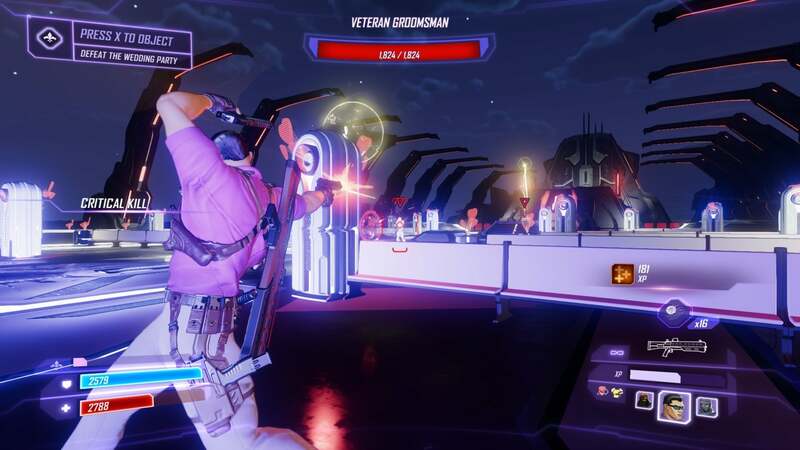 Agents of Mayhem’s side missions are just bland, padding out your time in the game to no purpose. The writing shouldn’t get a free pass. There’s an arrow-in-the-knee quip that’s impossible to miss, which in 2017 is even lower than low-hanging fruit. Many of the jokes don’t land, and the pacing is all over the place. It feels disjointed, jumping from villain to villain with no real build-up or climax and leaving plot threads twisting in the wind. A heavily foreshadowed revelation about the figure leading MAYHEM goes precisely nowhere at all, and that’s just one example among many. But thinking back to Saint’s Row and analyzing the setup of Agents of Mayhem, I still can’t help feeling that the repetition is the real issue. Saint’s Row had its fair share of stinker missions and uneven jokes, but you always knew genius was right around the corner. In Agents of Mayhem there’s nothing to look forward to. It feels like the writers just weren't given enough to work with—none of those tentpole "Deckers Die" missions that completely change up the formula and stand out in your mind. Agents of Mayhem is the same flat experience for hours on end, and then it fizzles its way into the credits. In my case, quite literally—a glitch in the last boss fight meant it kicked me into the final victory lap cutscenes before half his health bar was gone. No climactic kill, no daring comeback. Winner by accident. A fitting end, I guess. Side note: It’s also baffling that, with missions so interchangeable and so many characters on offer, there’s no co-op mode. That would’ve alleviated some of the repetition, in the same manner as Ghost Recon Wildlands or Borderlands. Alas. 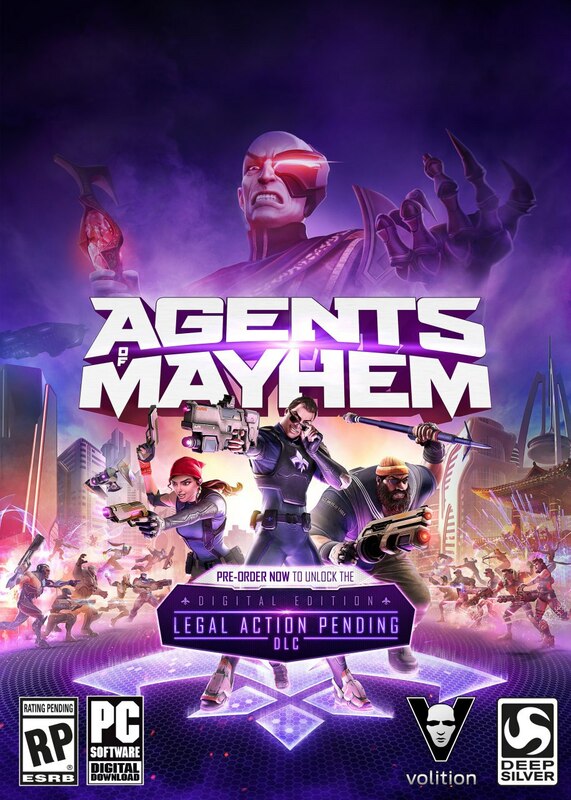 Anyway, for a game called Agents of Mayhem this is surely the least chaotic game imaginable. Volition finally got combat up to par, but to the detriment of literally everything else. It plays like a B-tier open world game circa 2011, prone to the excesses of Assassin’s Creed III or the first Watch Dogs and equally as lifeless. There are the seeds of something good here. Even at my most critical I can see where Volition hoped to take Agents of Mayhem. But the finished product is a muddled mess, somehow both too bloated and too empty—and worst of all, boring.